A pool filter is one of the main components of your pool’s filtration system. Its job is to rid your pool’s water of any small particles like dust or pollen. Your swimming pool filter works by passing the water through a filter bed to trap these small particles before the water is chlorinated and added back into the pool. Thanks to your pool filter, you don’t have to worry about swimming in dirty water—that is, as long as you’re regularly cleaning it. Wait, I Need to Clean My Pool Filter? Yes! You absolutely need to clean your pool filter. There’s a lot that goes into successful pool maintenance: shocking your pool, treating it regularly, and certainly cleaning your filter. Think about your home’s air filters. If you never changed them, you’d be breathing in tons of dust and debris. You can probably attest to this—the longer you wait to change your home’s air filter, the dirtier it becomes. Your pool filter works the same way. As your pool filter does its job, dirt and debris get trapped within the filter bed and start to cause buildup. How do I Know if My Pool Filter is Dirty? The main way to identify a dirty pool filter is by checking the filter pressure gauge located on the top of the filter. If the pressure is too high, it could indicate that there is too much buildup on your pool filter and water can’t flow through it quickly enough. The ideal pool filter pressure is known as clean operational pressure and varies based on the type of pool filter system that you have. 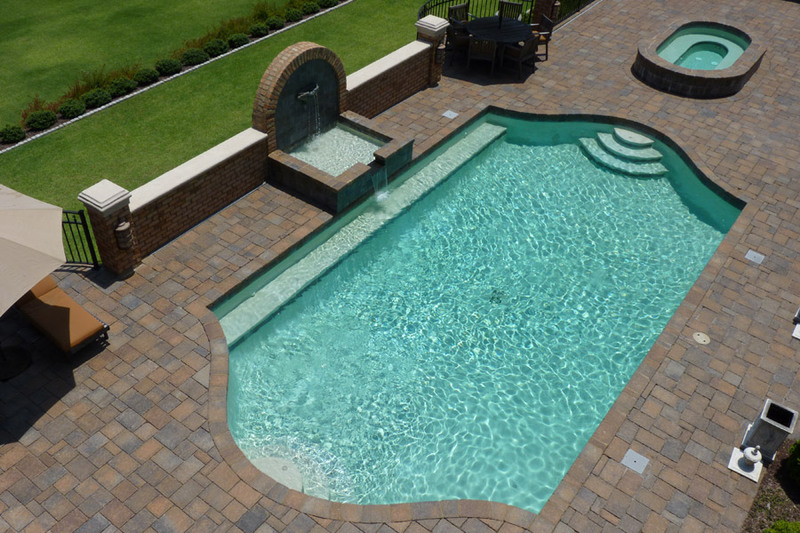 Most pool filter systems operate best in the 5-15 or 10-20 psi range. When your pool filter is installed, make note of the pressure at which it’s operating—this is your system’s clean operational pressure. When your pool filter pressure rises 8 to 12 psi above its clean operational pressure, it’s a good indication that your pool filter is due for a cleaning. The method with which you’ll clean your pool filter depends on the type of pool filter system that you have. There are three main types of pool filter systems. Each type of pool filter is named for the material within its filter bed that is used to trap debris. What is a cartridge pool filter? Cartridge pool filters are the most common types of pool filters. They operate the most similarly to air filters in your home, as pleated paper or fabric cartridges trap small debris that get past the skimmer basket in your pool. Cartridge pool filters remove particles from your water as small as 10-15 microns. They are energy efficient, cost effective, and economical. Cartridge pool filters do not require backwashing. How do you clean a cartridge pool filter? In short, you clean a cartridge pool filter by taking apart the filter body, removing the cartridges, spraying them with a filter cleaner chemical, hosing them off, and then putting the filter back together. Turn off the pool’s filtration system. Slowly bleed the air from the pool filter. Do this by finding the air bleed on your filter and slowly twisting it counterclockwise. You should hear a slight hissing noise that indicates air is being released from the pool filter. Opening the bleed valve will allow water to drain out of the filter itself. Using a wrench, open up the pool filter clamp and remove it from the filter. Once the clamp has been removed, take the top half of the filter off of the bottom base. This will expose your filter cartridges on the inside. Remove the manifold off the top of the cartridges. Gently lift each cartridge out of the pool filter base. Each cartridge will be very heavy—they’re holding on to lots of debris! Inspect each cartridge for tears in the pleats or cracks in the plastic. If you find any, you’ll need to replace the cartridge. Thoroughly spray each cartridge with a cartridge cleaner product (like one from poolife, Pool Season, or Baquacil). Let each cartridge sit for about 10 minutes with the filter cleaner chemical on it. While the cartridges are soaking, remove the plug from the bottom of the filter base and hose off the base itself. After 10 minutes, use a hose to spray down the filters individually. Place the cartridges back in the filter base and put the manifold back on top to hold them together. Place the top half of the pool filter back on top of the cartridges. Re-seal the pool filter clamp using your wrench. Make sure you seal the filter very tightly. Leaving the air bleed open on the filter, turn the pool’s filtration system back on. Allow the filter to fill up with water. Tighten the air bleed once water starts to come out. Once the air is out of your system, take note of what your filter gauge reads. This is the clean operational pressure of your cartridge pool filter. A sand pool filter is a compact and affordable pool filter that works on both large and small and in-ground and above-ground pools. Sand pool filters work by running your pool water through rough filter sand, which is made of silica. The individual grains of sand in a sand pool filter are usually between 45 and 55 millimeters in diameter. The sand in your pool filter acts as a medium to filter dirt and debris out of your pool water. As dirt accumulates in your sand pool filter, it becomes more difficult for your pool water to pass through. You must clean your sand pool filter from time to time. How do you clean a sand pool filter? What is a DE pool filter? DE (or diatomaceous earth) is a porous substance made up of fossilized remains of algae-like organisms called diatoms. It sounds a lot more intimidating than it actually is—it just looks like a very fine, white powder. DE coats the inside of a DE pool filter and strains out dirt, dust, and algae. DE pool filters are known as the most efficient type of pool filter. They are capable of trapping the smallest particles. For context, they can filter particles as small as 3-5 microns—much smaller than the naked eye can detect. How do you clean a DE pool filter? When your filter pressure gage reads 8-10 psi above the normal starting pressure, it’s time to clean your DE pool filter. The main steps that go into cleaning a DE pool filter are to backwash it, clean the manifolds and grids, and add new DE. Start by backwashing your DE pool filter. This will clean out any debris inside the filter. Place the filter valve in the backwash position. Turn on your pool pump. Once all the water has been released from the hose, shut off the pool pump. Return the pool filter valve to its normal position. Open your air bleed valve by turning it counterclockwise. Remove the drain plug from the bottom of the pool filter. Water will drain out of the filter. Once all the water has drained, use a wrench to open the clamp around the filter tank and remove it. Remove the top half of the filter tank. Remove the manifold on top of your pool filter grids. Use a hose to spray off each grid. Make sure you get rid of all the DE that’s coating each grid. Rinse the rest of your filter tank thoroughly. Place the grids back in the manifold and place them inside your filter tank. Place the filter tank cover back on and seal the clamp back into place. Make sure your air bleed valve is still open. Replace the drain plug at the bottom of the pool filter. Turn on your pool pump to fill the pool filter with water. Once water starts coming out of the air bleed valve, seal the valve. Within about five minutes, you’ll want to recharge the filter with new DE. The longer you wait, the more dirt begins to accumulate on the filter grids. Follow the instructions on your DE’s packaging to determine how much DE to add. Mix the DE with a bucket of pool water. Make sure the mixture is free of lumps. Slowly pour the mixture into your skimmer. This mixture will then coat your DE pool filter. After adding the mixture, make note of what your filter gauge reads. This is the clean operational pressure of your DE pool filter. If you need any help maintaining your pool or cleaning filters, don’t hesitate to contact us today or come by our storefront. © 2019 Genco Pools & Spas | An Engenius website.